Day 131: 360 N Michigan Ave. The building located at 360 N Michigan Ave has been named many things over the years: originally the Stone Container Building and then the London Guarantee Building, but as of 2001 it was renamed the Crain Communications Building. It is a historic building located in the Loop community area of Chicago, and is known as one of the four 1920s flanks of the Michigan Avenue Bridge (along with the Wrigley Building, Tribune Tower and 333 North Michigan Avenue). Located in the Michigan–Wacker Historic District, the building stands on the property formerly occupied by the Hoyt Building (from 1872-1921) and part of the former site of Fort Dearborn. Designed by Alfred S. Alschuler and built in 1922-23, it was designated a Chicago Landmark on April 16, 1996. The top of the building resembles the Choragic Monument of Lysicrates in Athens, but it is supposedly modelled after the Stockholm Stadshus. It can be seen in the TV show Perfect Strangers as well as in the show Family Matters. 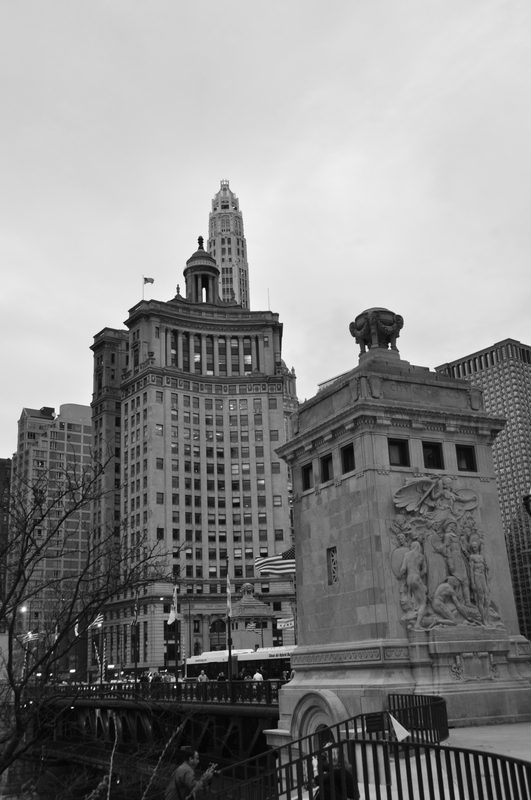 This entry was posted in Architecture, Bridges, Chicago, Historic Landmarks. Bookmark the permalink.